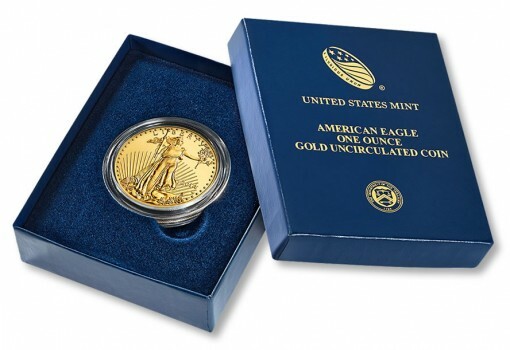 Staring sales of the 2014-W $50 Uncirculated American Gold Eagle Coin hurdled the sales start of last year’s coin, figures published Tuesday by the United States Mint show. Between the Gold Eagle’s release on Thursday, May 22, through to Sunday, May 25, collectors ordered 1,844 coins. At $1,575 for each, the U.S. Mint took in orders totaling $2,904,300. Last year’s release logged debut sales of 1,448 coins at $1,725 each for a total of $2,497,800. Lower pricing supported the early boost in sales this year, and the 2014-W Uncirculated Gold Eagle will remain at $1,575 for at least another week. Gold has declined, last near $1,263 an ounce compared to near $1,300 an ounce when the Gold Eagle was released. Still, the precious metal has not fallen enough to place its average within another tier that would trigger a change in the Gold Eagle’s price. Its current price is based on a London Fix weekly average gold that is within $1,250.00 to $1,299.99 an ounce. The next chance at a possible price change is Wednesday, June 4. Here is a breakdown of final sales for all the uncirculated Gold Eagles since they were introduced in 2006. The uncirculated coin is available from United States Mint at usmint.gov/catalog or by calling the toll-free number 1-800-USA-MINT (872-6468).